Passport to Go! provides funding for first-year or new transfer students to obtain their first U.S. passport. This program was designed to support our Opening Access work by encouraging students to begin participating in global opportunities early in their academic careers. The Passport to Go! program includes an award of $145 to cover the cost of a student’s first U.S. passport. 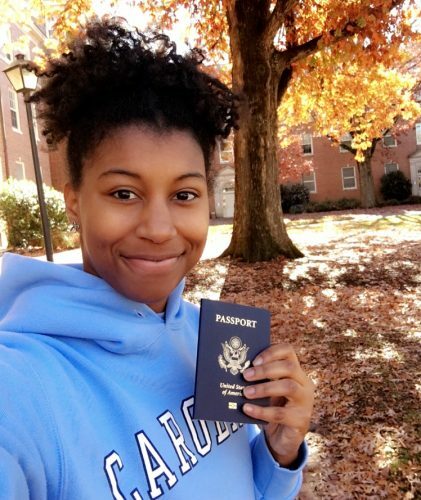 Students complete the passport application process on campus with State Department representatives during the annual Global Passport Drive (typically in mid-November). Passport to Go! also provides multiple events and networking opportunities throughout the year for students to meet with faculty and staff from UNC’s area studies centers, program alumni, and others from across campus to support them in planning and funding their first global experience. For more information about eligibility, program requirements and how to apply, visit the Passport to Go! funding page. Interested in funding a student’s first passport and participation in the Passport to Go! program?